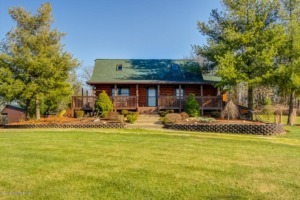 This well-maintained cabin style home, sits atop a 15 acre mountaintop and is located less than ten minutes from downtown Shelbyville. You will find rustic wood finishes throughout, as this home brings private, country living together with city convenience. The main floor includes a master bedroom, full bathroom, formal dining room, eat in kitchen, and loft area that is perfect for a second bedroom or office! Go down the spiral staircase and you will find another bedroom and full bath, laundry room, and large living room/tv area with a walkout door to the garage. With skylights and large windows throughout the natural light and scenic views are endless. The property includes rolling hills, a pasture, and creek, all surrounded by quality fencing. Both equipment barns were built in the last three years, along with the fencing. Schedule your showing HERE.